NoSQL databases like Cassandra and Couchbase are quickly becoming key components of the modern IT infrastructure. But this modernization creates new challenges – especially for storage. Storage in the broad sense. In-memory databases perform well when there is enough memory available. However, when data sets get too large and they need to access storage, application performance degrades dramatically. Moreover, even if enough memory is available, persistent client requests can bring the servers to their knees. 1. 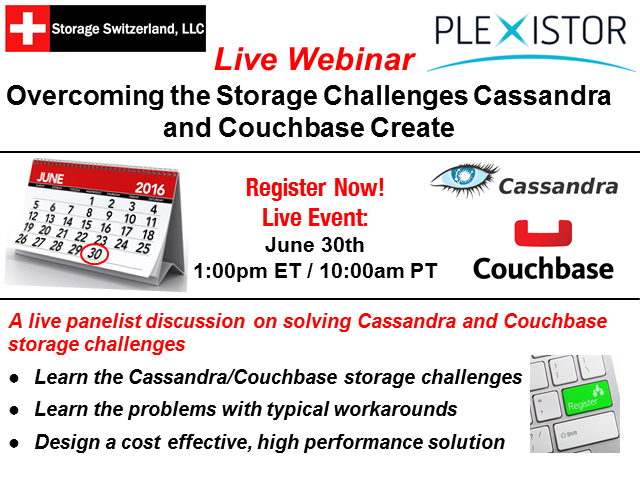 What is Cassandra and Couchbase? 2. Why organizations are adopting them? 3. What are the storage challenges they create? 4. How organizations attempt to workaround these challenges. 5. How to design a solution to these challenges instead of a workaround. Micro-focus Project and Portfolio Management (PPM) Logging Tips and Tricks: Learn how to get the most out of your logging.conf, discuss logger names per the Micro Focus PPM functional domain and see how creating separate nodes will increase performance. AI FIRST Project Management: How we Augment Project and Portfolio Managers with Micro Focus PPM and Artificial Intelligence: Right now, there is a lot of hype around Artificial Intelligence and Machine Learning; these technologies are going to profoundly disrupt every industry and make most applications SMART in the next 5 years. We have built AI aides around our PPM implementation in order to augment our Project and Portfolio Managers as well as Project Team Members. These tools help them to be more productive and have consistent results. We will Demo some of these features live, and discuss implementation challenges and future work. Join us for the next upcoming SIG Talk on Thursday, June 21, 2018: https://www.vivit-worldwide.org/events/EventDetails.aspx?id=1112917&group=. This webinar is brought to you by the Vivit DevOps Special Interest Group. Businesses need to be more responsive to market changes and meeting customer demand for improved services and better user experiences. In order to meet such high expectations and be competitive in your market, it requires great flexibility and speed throughout the organization. DevOps enables your software development, infrastructure and operations teams to identify and eliminate inefficiencies through communication, collaboration, and automation. Digital transformation, acceleration, innovation. Buzzwords or not, these words reflect the reality of every existing business fighting for new revenue streams, better customer experience, and faster delivery of new services. To support these business objectives, IT organizations need to focus on increasing performance and workforce productivity without driving additional costs. At the same time, it is imperative that tools need to adapt to the way people work today. In this session we will present the new, re-architected Micro Focus ITSM Automation solution (formerly known as HPE ITSM Automation). Micro Focus ITSM Automation software can be installed on Amazon Web Services, brings a new user experience, greater collaboration, and many other new capabilities. It is based on machine learning and analytics, to adapt the tools to the needs of business users and IT. Greenlight Group, a managed service provider, will discuss what helps them meet the most stringent SLAs while constantly providing new service offerings to their customers. During the webinar, you will also see the new ITSM Automation release live in action. As a retailer SPAR has solved their issues with web store rollout. Vodafone reduced events by over 80%. Boeing evolved most of the users from OM to Operations Bridge in less than 3 months. They have all gained visibility, focus on the right IT issues impacting business, and moreover autonomous operations. They profit from the high degree of automation that the Operations Bridge brings as well as the significant way it helps integrate their tools and data into a single service driven prioritized view. To launch this SIG, we’ll show you some of their work and the benefits gained. We’ll introduce you to the latest version of Operations Bridge, speak about the containerized version and its roadmap within the new Micro Focus branded software company. All this should inspire many questions for a lively SIG session, one of many more to come. More IT and computing is moving to public networks such as Amazon Web Services (AWS) and Microsoft Azure. Increasingly, internal/private IT is being restructured to provide similar services. Along with this are changes in the ways applications are being built, deployed, and maintained reflected by the rapid adoption of containers and microservices. What does this mean to IT Service Management and the service desk organization? Join this webinar to learn w HPE Software and our ITSM Automation (ITSMA) solutions are doing to both take advantage of these trends and also help support these trends. We’ll discuss the benefits to the service desk team of faster deployments, quicker time to value, and reduced administration and maintenance. Please join us to learn more about what HPE ITSMA provides today and what’s coming soon. In this time of continuous improvement, the pressure on IT has never been greater to deliver. The business expects a steady stream of innovation, and to deliver, it is imperative IT find ways to deliver continuous improvements measured in days in weeks, not months and years. And the mandate rarely goes hand in hand with budget increases. The HPE Pre-sales Value Consulting team can help you unleash the value in your existing investment. Join us for this webinar to learn about a proven methodology we’ve built to take you on this journey and to help you and your IT teams understand your current state, share HPE’s broad experience in this area and identify quick wins you can adopt for repeatable success. Your business requires a solution that constantly evolves and provides your operations teams with coverage of various technologies and hybrid IT environments. Let us describe the strategy, roadmap and vision of HPE Software Operations Bridge. We’ll include information about using HPE Operations Agent to manage public and private cloud, and Docker containers and how to optimize allocated resources, examine 300+ metrics in real time and provide executive stakeholders with actionable intelligence. Join Roy Ritthaler, VP of Product Marketing IT Operations Management and Genefa Murphy, VP of Partner and Product Marketing, Application Delivery Management at Hewlett Packard Enterprise Software, as they discuss the challenges and opportunities of digital transformation in organizations today. They will also discuss how IT management can accelerate your transition to the digital enterprise. Transformation is driven by business needs, and innovations in application delivery and testing, hybrid cloud, machine learning, collaboration and mobility. By leveraging these innovations you can manage risk while also realizing rapid time to value and to market. In this webinar you will learn how Sopra Steria is implementing Avatars to improve the Customer Experience without having to replace the underlying Service Management platform. Almost everyone is undergoing digital transformation, but not everyone knows the right way to do it. In a recent MuleSoft survey, 96 percent of respondents are executing on digital transformation initiatives or planning to do so in the near future. However, the results also showed that just 18 percent of IT decision makers are confident that they will succeed in meeting this year’s digital transformation goals. To do this effectively, IT teams need different skill sets, tools, and more importantly, different mindsets. Join Bill Briggs, CTO at Deloitte, and Ross Mason, Founder and VP of Product Strategy at MuleSoft, to learn how IT can grow beyond “business as usual". Application-centric enterprises recognize the importance of automating infrastructure to deliver applications quickly. Software-defined networking solutions such as Cisco ACI enable programmable infrastructure for networking and operations teams. However, appliance-based load balancers require manual configurations, cannot scale horizontally, and are expensive in many cases. They represent a "last-mile" challenge for automation. A software-defined approach to application services can extend the value delivered by SDN solutions to load balancing and L4-L7 services. Employees might feel intimidated or overwhelmed with the amount and diversity of business data available to them. Accessing and harnessing all of that data could be a game changer for them, but they're not sure how to do it. Up until now integrating, analyzing, and understanding all those data sources hasn't been easy, timely, or affordable for your team - not to mention your business users. Your main role has been telling them what they can't do. What if you could offer a comprehensive solution that business groups could use on their own terms - to answer their own questions? Just imagine how your role would change from being a traffic cop to a strategic advisor. How are you validating the behavior of your Mule app before you send it to QA? Did you know that there is a testing framework that automates the testing of Mule apps? Join this webinar to learn what you may not know about testing your Mule applications within Anypoint Studio. In today’s environment speed and quality are two of the biggest factors in delivering products and/or services to your end users. As a result, organizations and individuals have recognized the role that Performance Engineering practices delivers as a competitive differentiator. We will deliver a 1 hour vendor neutral webinar discussion, focusing on “Performance Engineering as a Competitive Differentiator.” The expert panel will collaboratively discuss how the capabilities of Performance Engineering have been recognized as a significant competitive differentiator across all: geographies, industries and markets. You will get tangible examples and stories that you can use to share and promote how Performance Engineering practices can be used within your organization and teams, so to drive competitive advantage in the market. Microservices is one of the hottest technology trends for 2016. Join us to learn what microservices mean for your business, as our technical experts take you on a journey through microservices best practices and implementation using Anypoint Platform. This online channel will feature live webcast presentations by leading IT and business executives. In today’s economic environment it is imperative that IT find ways to become more efficient while maintaining, or even increasing, the levels of service that it provides. Automating IT functions is the best way that IT can achieve these conflicting objectives. The IT Automation channel speakers will look at how to increase the productivity while reducing the cost of IT operations through automation and the application of industry best practices. The presentations will show you the steps to take and the tools that you will need to improve the performance of your IT operations.